LearnMMD.com offers the latest version of MikuMikuDance. Download MMD! Released December 5th, 2017, MMD 9.31 represents the newest, latest version of MikuMikuDance. Click the button to Download MikuMikuDance for Windows XP, Vista, Windows 7 and Windows 8! If you are running a 64-bit computer and you want to download the 64-bit MikuMikuDance, 64-bit MMD, you will want to visit the LearnMMD.com Downloads Page for the 64-bit version of MikuMikuDance. MikuMikuDance is Free 3D Animation software created as a promotion for the Yamaha/Sony/Sega Vocaloid products. Download this Free 3D Animation program … and be sure to see some of the thousands of MikuMikuDance, MMD videos on YouTube. 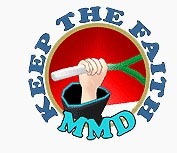 Just Search for MMD … and Enjoy! MMD has a huge following on Deviant Art, as well. Again … go to DeviantArt.com and search for MMD to see a sample of what is available online. A great source for new models and new accessories is Mikudance.info … check it out! There is no “installation” for MikuMikuDance. The MMD folder simply sits on your desktop. You open the folder and click on Miku’s smiling face icon to run the program. I right-click on the program icon and Create Shortcut … and then drop the shortcut onto my desktop. We are still learning about “what’s new” in MMD 9.31 compared to the previous versions. LearnMMD’s Beginners Guide to MikuMikuDance! MikuMikuDance often will not run on your first attempt. It requires a proper environment on your PC. Our Parkeerwacht put together an article describing the solution to many of the errors that a new user may encounter. Missing DLL’s, side-by-side configuration errors, and other errors are discussed there. The original DirectX version of MikuMikuDance, MMD 7.39, always needed the DirectX 9C software on your computer. You will need it to run the latest versions of MMD, as well. LearnMMD.com has that download available for you! Download the DirectX 9c Update. If cannot move, please install following runtime package. It is critically important to have those packages installed in your system. MMD will not run properly without them, and will not accept higher versions of the same as a proper replacement¹. The majority of comments asking for help about MMD acting wrong will be countered with “Have you DirectX and MS Visual C++ runtimes installed?” inquiry, and more likely than not, resolving these will resolve your problem as well. VISIT VPVP https://sites.google.com/view/evpvp/ … the official homepage for MikuMikuDance! LearnMMD still has the original MMD 7.39! Downloand MMD 7.39 from LearnMMD.com. Each newer version simply replaces the earlier versions on the VPVP homepage … so you cannot get the older MMD 7.39 there … But LearnMMD still has it for you! Often times MMD 7.39 will run for you when MMD 9.31 will not. ENJOY MikuMikuDance … with MMD 7.39. It is missing MMD 9.31’s latest refinements … but it does everything and runs well on most systems. io vorrei provarlo. spero che mi soddisfi per quanta curiosità ho. I’m on windows 10. Can I still download the program/software?